Let’s start with my conclusion and then work backwards. Nothing has changed over the past few days, weeks and even months. I still view stocks positively the farther out you go. The short-term remains murky, uncertain, questionable and any other adjective that is less than flat out bullish. One of my chief concerns, sentiment, has begun to reset itself at least to neutral from the overly enthusiastic category. Sentiment surveys have improved as have the put/call ratios in the options market. On the flip side, stock market internals have been downright putrid. When I say “internals”, I am referring to the number of stocks going up and down each day along with how many stocks are hitting fresh 52 week highs and lows. Additionally, high yield bonds, one of my favorite canaries in the coal mine have seen five straight days of heavy selling, which is not comforting. While it’s possible that the market pullback ended yesterday with stocks off to the races again today, I just don’t think that’s the most likely scenario. Rather, it looks like most of the major indices will remain in their trading range with perhaps one or two popping quickly to new highs. If that’s the case, I would rather be a seller into such strength than a fresh buyer. Sector leadership is very favorable right now for future gains, with the exception of the transports, once we get by this continued period of digestion and consolidation. It’s not the time to get bearish, just to be a bit more cautious and selectively prune into strength. Better opportunities are not that far off. Yesterday, I wanted to see what leadership emerged after Wednesday’s big surge and more importantly, I wanted definite confirmation from the plan vanilla high yield (junk) bond mutual funds that the canary wasn’t dying. That was before the open. I have to say that the depth and tenaciousness of Thursday’s decline definitely caught me off guard. While giving back 25% or even 50% of the big rally would not have out of the ordinary, losing all of it certainly was. It reminded me of January 2008 as stocks were groping for their first low of the year. 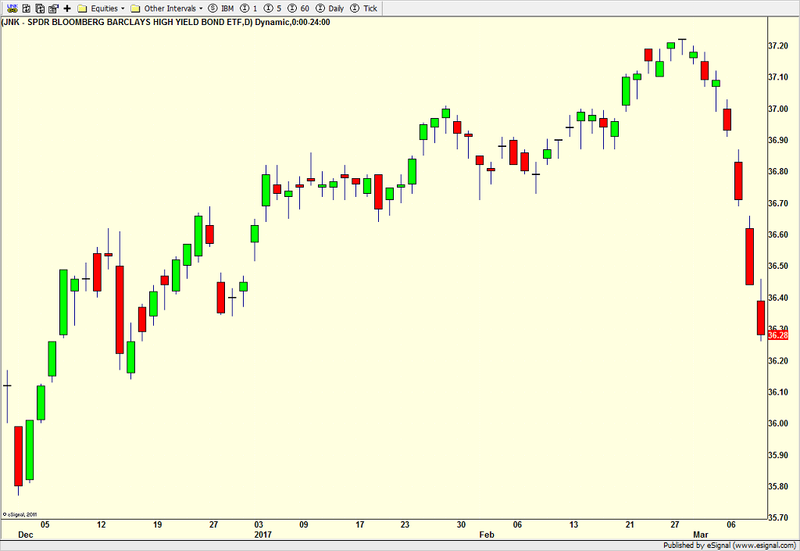 The anticipated up day in plain vanilla high yield bond funded ended up as a moderately lower day in the end. That is not good. It says that liquidity is leaving the market and shows concern that the economy may not be as stable and strong as the jobs report indicated. At this point, high yield bonds look like they want to continue lower as water finds its own level. The positive from my selfish perspective is that there should be a very solid buying opportunity over the coming month for a good trade into the New Year. I can’t believe I just typed “New Year.” Wow, did this year fly by! Looking at the stock market, earlier this week I wrote that there was a 15% chance of a 8-11% correction taking the Dow below 16,000. That scenario certainly looks like it’s shaping up. With the August lows in the S&P 400 and Russell 2000 long breached, the S&P 500, Dow and Nasdaq 100 should not be too far behind. Given the depth of the pullback, a scenario should unfold where stocks see some capitulatory selling next week or soon thereafter followed by a feeble rally and final decline into the ultimate bottom. I will discuss more if and when this unfolds. For now, it’s probably too late to sell and too early to buy. Patience is the virtue. Have a safe and enjoyable weekend, especially if it’s a long one for you! I would be surprised if the media doesn’t start talking correction, crash, etc. with possible Blue Monday. For most of September, I discussed the very negative seasonal period that ended on September 30. Remember, poor seasonals with strongly negative short-term trends from the Fed and options expiration usually just provide a headwind or accelerant to a market move already in place. The second half of September was certainly a poor showing for the bulls, which is part of the reason October began so weak. 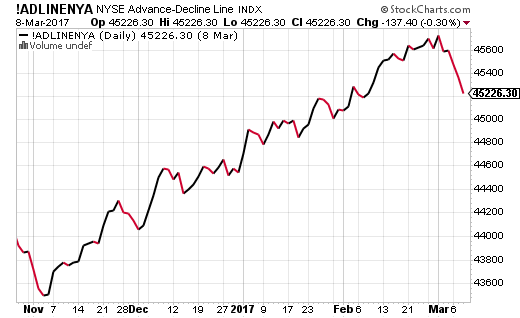 For those who watch the charts, the Dow and S&P 500 visited their 150 day moving average this morning and are trying to bounce right now. The Nasdaq 100 has been much stronger and the S&P 400 and Russell 2000 have been downright ugly. While a small rally would be nice, it doesn’t seem like the final low is in just yet. A more likely scenario would see stocks move a little higher and then sell off once again next week or the week after to what could be the final solid trading low of 2014. Between now and then, I will be keenly watching how the various sectors behave as well as high yield bonds. There has been much damage that needs repair before another rally to new highs begins. At this point, the bull market is wounded, but certainly not dead. It’s time for another update on the canaries to assess the bull market’s health and I will try to get to that early next week. It’s been a relentless assault on the bond market and other interest rate sensitive instruments of late. Treasury bonds, mortgage backed securities, high quality corporate bonds, junk bonds, utilities, REITs have seen intense selling pressure that has only paused for a day here and there since late April. Telecom, REITs and high yield bond mutual funds all hit our sell triggers last month and it certainly feels like consumer staples mutual funds and a few more bond ETFs aren’t too far behind. I do NOT believe the bull market in stocks is over, but leadership has and is changing.